I have a client that I am doing some organizing for. We ran across these Masonic pendants, but she does not know where they came from or the story behind them. She is wondering what they are, and after doing a little searching on Google, it looks like they are similar to some of the jewelry you show on your web site and I was hoping you could give me more information on them and I will pass it on to her. 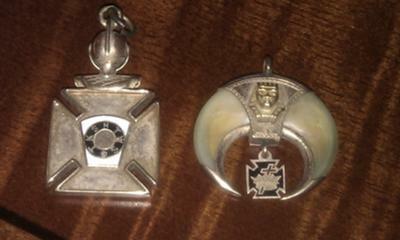 The pendant on the left is a York Rite Pendant. The letters, HTWSSTKS translate to "Hiram The Widow's Son Sent To King Solomon". The pendant on the right represents the Ancient Arabic Order of the Nobles of the Mystic Shrine. This appendant body within Freemasonry is usually simply called "Shriners". It was established in 1870 in the United States. You may also see it abbreviated as A.A.O.N.M.S.. Within Freemasonry, this organization is deemed the "social" body of Freemasonry. Shriners can be seen in parades, wearing strange looking red hats called fezzes which display the above emblem. Shriners have many charitable causes toward which they volunteer their time in order to help others. 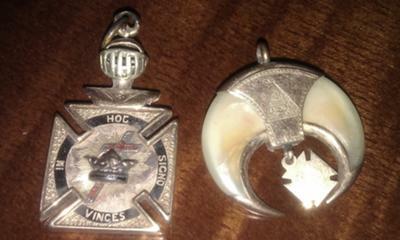 Here is more information about these Knights Templar and Shrine pendants. Greetings, the one on the left is two fold. On one side it has the Knights Templar Emblem and on the other is an Emblem of a Keystone of the Royal Arch Mason. The Emblem on the right is that of the Shriners, or Nobles. The Emblem hanging under it belongs to the Knights Templar, so I'm going to assume that whomever these belong to, or did belong to was a Knights Templar as well as a member of the Mystic Shrine. Thanks for taking the time to share some Masonic education, PDDGEC.